- Once Central Alberta had a registered section of TCT, we asked the TCT Foundation to fund a TCT coordinator position to assist our small band of volunteers in moving along the process. For the past three years, Derry Armstrong has been working with CARTS to help build the TCT in Alberta. A few months ago, we received word that the funding for this position had been discontinued, but there is no doubt that Derry has helped in the efforts to promote and build trails in Central Alberta. The Bridges: In order to link communities within Central Alberta, several bridges were necessary. The two key bridges are located between Blackfalds and Red Deer over the Blindman River and in Ponoka over the Battle River. CARTS helped municipalities in these regions apply for and receive funding from the TCT Foundation for the engineering of both of these bridges and have helped them apply for and receive funding for a large part of the construction costs. We also contacted the Canadian military engineers to seek their assistance in building the bridges. This past year, both bridges were completed on time and on budget. Trails: A great deal was accomplished in terms of trail-building in Central Alberta this past year. Each community involved in CARTS had significant trail development. In addition, work has been done in terms of linking trails between communities. Red Deer County has begun the work of linking Springbrook and Penhold and anticipate that trail to be completed by the end of this year. Lacombe County has been working on plans to link the bridge they just constructed with a walking/biking trail that connects to the Town of Blackfalds. The Town of Ponoka just constructed a bridge over the Battle River and has built a significant amount of trail connecting it to the border of the County of Lacombe and JJ Collette Natural Area. Funding: CARTS is organizing a specific fund for Central Alberta Trans Canada Trail (TCT) through the Trans Canada Trail Foundation. This should be in place very soon. This will ensure that funds raised in Central Alberta stay in Central Alberta. The last round of TCT Funding will be given out this year and CARTS hopes to help the communities in Central Alberta who are still working on TCT trail construction to obtain funding. There are several proposed trails in Central Alberta that are not designated as TCT. CARTS may be able to assist with setting up a special fund through Alberta TrailNet so that donors can receive tax receipts and that money can stay in Central Alberta. We have already talked to ATN and will proceed with that as the need arises. Resolution: CARTS helped to coordinate Central Alberta communities in bringing forth a resolution regarding trails to the AUMA (Alberta Urban Municipalities Association) Convention which took place in November 2009. The jointly-sponsored resolution asked the provincial government and Alberta Transportation to consider non-motorized modes of transport when they are building or upgrading roads and highways. It was passed almost unanimously at the AUMA Convention. 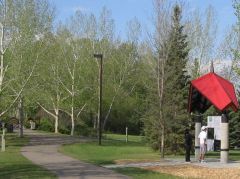 Blindman River Bridge: The County of Lacombe and CARTS are hosting a grand opening event for the Blindman River Bridge on June 5, 2010 at 1 pm. Battle River Bridge: The Town of Ponoka will be scheduling a grand opening ceremony for the Battle River Bridge in the coming months. More Trail Construction and Planning: CARTS continues to support trail development in Central Alberta and is currently working to assist Lacombe County in planning trails to link the new Blindman River Bridge with Lacombe and Blackfalds. Red Deer County is planning to complete the linkage between Springbrook and Penhold this year and have several other key trails identified in their future plans. 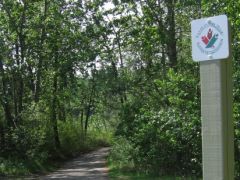 Ponoka is planning to get more trail on the ground linking the town with JJ Collette Natural Area and the borders of Lacombe County. Promotion of Trails: Several Central Alberta communities are planning events this summer and fall to promote trails. CARTS will continue to encourage and promote such events.